Over 300 business and industry leaders, bankers, entrepreneurs and government officials from throughout Southern New Jersey will meet to discuss improving the region’s economy and promoting job creation. The 12th Annual Tri-County Economic Development Summit is sponsored jointly by Burlington, Camden and Gloucester Counties and will showcase the region’s resources in both the public and private sectors, as well as highlight many of the economic agendas and advancements of South Jersey. 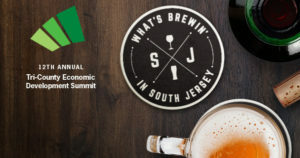 With the theme, What’s Brewin’ in South Jersey, this year’s summit will focus on new and upcoming tourism with local wine and beer producers. This year’s keynote speaker is Jake Buganski, Acting Executive Director of the New Jersey Division of Travel and Tourism.